BMAN30111 Advanced Corporate Finance Summary The note is for module BMAN30111 Advanced Corporate Finance offered at the University of Manchester. It includes nice and easy to read summary of lecture notes and compulsory readings in bullet points. I used this note to get 80 for the module! Perfect for last-minute revision if you run out of time making your own one! Summary Corporate Financial Management (Grade: 7,5) This is a summary of the selected chapers for the course Corporate Financial Management. This course is part of the Master Accountancy & Control at the University of Amsterdam. 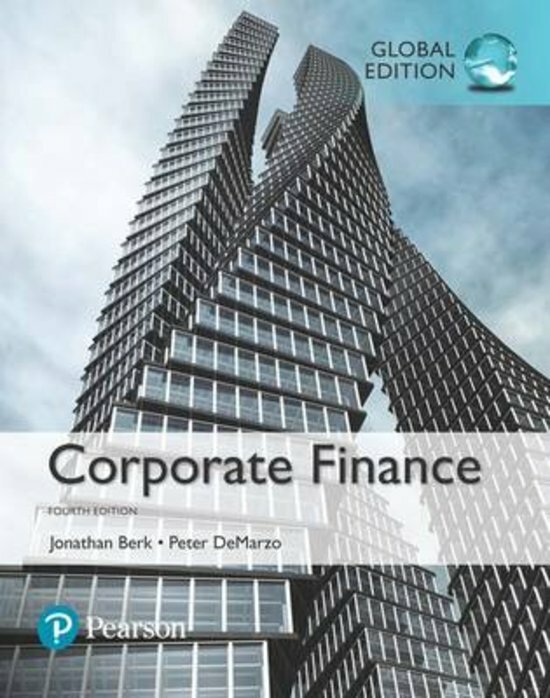 Summary book Finance ENDTERM or Finance II Summary of the book Corporate Finance for Finance for pre-master end-term of Finance II. It includes chapter 14 till 30. Tax Loss Carry Forward and Personal Taxes These are the lecture notes for TLCF and Personal Taxes part of Corporate Finance. I have other notes for other modules and I graduated from LSE with a Distinction. So if you need help or tutor, just contact me. Thank you. Sur cette page, tu trouveras des résumés, des guides de révision et bien plus de livres de révision Corporate Finance, écrits par Jonathan Berk & Peter Demarzo. Les résumés sont écrits par les étudiants eux- mêmes, ce qui te donne les meilleurs renseignements sur ce qui est important de réviser dans ce livre. Les sujets tels que corporate finance, Finance, Corporate Finance, finance, berk and demarzo & 0 1 & pre-master seront traités.